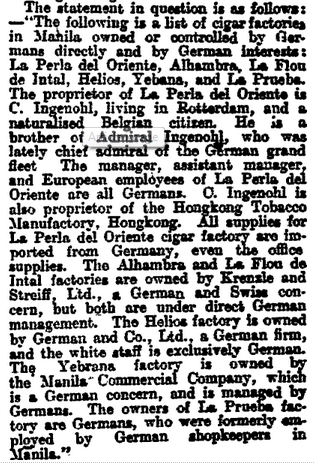 HF: Carl Ingenohl operated cigar manufacturing companies in both the Philippines and Hong Kong under the trade name La Perla del Oriente. In Hong Kong Ingenohl ran the Orient Tobacco Manufactury Company which had a factory in Yau Ma Tei. The newspaper article below mentions his ownership of the Hongkong Tobacco Manufactury which I believe was actually the Yau Ma Tei factory. Or were there two companies? “The proprietor of La Perla del Orient is C Ingenohl, living in Rotterdam, and a naturalised Belgian citizen. He is a brother of Admiral Ingenohl, who was lately chief admiral of the German grand fleet. The manager, assistant manager, and European employees of La Perla del Oriente are all Germans.